Thank You for Your reply! Please look below for the answers. 1. Has the protein transfer to the membrane and quality of the sample been assessed using a loading control? We always use a loading control for western blot. The pdf document that I had sent to you earlier indicates beta actin as a loading control clearly. 2. Is the current vial of secondary antibody working well with other primary antibodies ? Yes, it does. We are running several western blottings every day, so our secondary antibodies are almost daily tested by several colleagues. The host species for the abcam c-MET primary antibody is goat. For beta actin primary antibody , the host species is goat as well. The secondary antibody used was the same for both these primary antibodies (donkey anti-goat). The beta actin bands are very clear, whereas there were no bands for c-MET. This clearly indicates that the current secondary antibody vial works. Similarly, the rabbit secondary antibody used for flow cytometry has been in continuous use in our lab and the current vial works. Regarding the western blotting: if the signal is very mild or weak, then we can enhance the signal using a higher primary antibody concentration, but if we have no signal (even with the femto chemiluminiscence detection), then I personally have doubt that increasing the antibody concentration will help. With respect to flow cytometry, increasing the concentration of primary antibody, we have to increase the corresponding IgG control, which in turn may result in proportional higher signal. Nevertheless, I will take your suggestion and use a higher concentration of the antibodies. In the meanwhile, could we kindly proceed with this decision of replacement of the antibodies. I am sorry the products did not perform as stated on the datasheet and for the inconvenience this has caused. As requested, I have issued a free of charge replacement with the order number ######. The details you have kindly provided will provide us with vital information for our monitoring of product quality. I appreciate the time the customer have spent in the laboratory and understand their concerns. It is regrettable the results have not been successful. Reviewing the details, I am sorry there very few tips to provide on this occasion to help improve the results from either of these antibodies. I can suggest it is possible you may have regrettably received a bad vial on this occasion. 2. Is the current vial of secondary antibody working well with other primary antibodies? 3. I can suggest to try increasing the antibody concentration, for example 0.5 or even 1 ug/ml. The dilution provided on the datasheet is a guideline only. Increasing the concentration may help increase the signal. 1. Antibodies are usually used at quite a high concentration in flow cytometry, often at a dilution between 1:10 to 1:50. Has this been tried? It may increase the signal obtained. Alternatively, or if these tips do not work, I am pleased to offer you a free of charge replacement or credit note for each antibody in compensation. Please find this complaint below. Thank you for your quick handling! 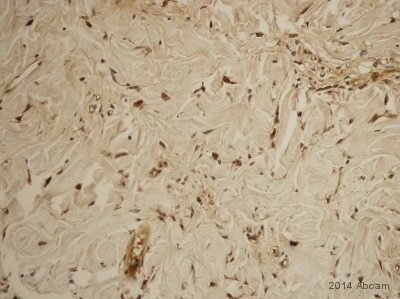 I had recently ordered a c-MET antibody (ab10728) and VEGFR-2 antibody (ab2349) from abcam. I regret to inform You that these antibodies are not working. Please find attached the pdf. document with this email and be so kind to go through the labeled figures that I obtained through western blots and flow cytometry analysis. The major criteria that I chose these abcam antibodies were as follows: 1, these work on both mouse and human cells; 2, c-MET antibody can be applied in western blot and the VEGFR-2 antibody can be applied in flow cytometry. Therefore I would like to kindly request You to replace these antibodies by suitable alternatives that satisfy the above criteria. I would like to reassure you that our antibody are tested and covered by our 6 month guarantee for the tested applications and species listed on the individual datasheets. In the event that a product is not functioning in the tested applications and species cited on the product data sheet (and the problem has been reported within 6 months of purchase), we will be pleased to provide a credit note, free of charge replacement or refund. I appreciate your concerns and it is regrettable the results have not been successful. Before deciding how to proceed in this case, I would like to investigate this particular case further for you, and also obtain more information for our quality monitoring records. In order to proceed with this, I have enclosed a technical questionnaire below. I would appreciate if you could complete this. It will help you put the information we require together very easily. How many times have you tried the FACS? thank you for your e-mail. I've contacted the customer and he told me that the aliquote he used was never put at -20°C, but directly used for the experiments. I mean, when he received the Ab, he aliquoted the Ab and put all the aliquotes at -20°C except the one which he used and stored at 4°C so in this case it is not a a problem of stock temperature. Can you please help us in understanding which is the problem? I appreciate the time your customerhas spent on these experiments and would be pleased to arrange in compensationa credit note ora replacement with either a different lot of ab2349 or an alternative anti-VEGF receptor 2 such as ab39256, ab39638, ab131441, ab45010 orab131510. I look forward to hearing from you with details of how you and your customerwould like to proceed. I received this antibody, however it does not seem to be working (no signal in mouse spleen frozen tissue sections). 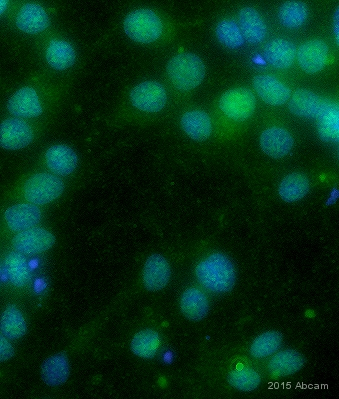 I have another antibody that works well, so I know it is the antibody and not my sample. Can you recommend another antibody raised in rabbit for my experiments? Thank you for contacting Abcam regarding ab2349. Thank you for your fast andcomprehensive answer. It will save much timme for me and my team. You were right about productS. Second antibody was VEGFR-2 withab2349 number and LOT number:GR88596-1. But I actually found some information at your site under "scientific support" label. But if you find some more time to offer me same thing (same tissue, same work) as you did withab64569it would be great :-). Anyways, thank you and good luck! Thank you for your reply. xxxxis currently away from the office but I hope I can provide you with the information you have requested. The IHC-P protocol followed with this antibody inhouse was performed using HIER withCitrate Buffer pH 6.0 and the antibody was detected using an HRP polymer using DAB and hematoxylin used as a counter stain. If you require any further information please do let us know.